In a world full of customs offices and immigration departments, where borders and national identities play powerful roles, thousands of individuals experience similar crises and conflicts, and joys and frustrations, no matter where they live around the globe. Although the commonality of these experiences often goes unrecognized by politicians and policy-makers, the Houston-based non-profit organization Voices Breaking Boundaries (VBB) seeks to document these parallel realities. Through an ever-increasing diversity of productions and artforms, VBB has been fulfilling its mission to “cross borders, sustain dialogue, and incite social justice through art” for fifteen years. Along the way, it has garnered funding from such prestigious entities as the National Endowment for the Humanities, the Andy Warhol Foundation, and the Houston Endowment. Founded by five women artists in 2000, Voices Breaking Boundaries has been directed by Sehba Sarwar from the beginning. A Pakistani-born writer and artist, Sarwar divides her time between Houston and Karachi, Pakistan. 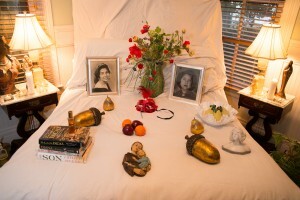 On-site artists created this alter/shrine in the home Frank Aguilar at “Exploring Rituals” in December 2013. From the start Sarwar has led VBB to focus on a particular form of democratization to promote social justice – that of shared art and experience. VBB achieves this goal in a variety of ways. It acts as a platform for up-and-coming artists, allowing them to find an audience without having to work their way into the upper circles of Houston’s art society. Its exhibits also present local problems through a global perspective, highlighting similarities between the experiences of marginalized communities in the United States, South Asia, and other parts of the globe. Most importantly, VBB has developed a variety of art productions that bring art directly into the community. As an “unfixed” arts association that prefers to work without a permanent production space, VBB has used the community as its constant canvas, encouraging cross-cultural understanding among diverse peoples and nations each step of the way. Voices Breaking Boundaries is unique in that it is an arts/activist association directed by a South Asian artist, with the goal of reaching a broader multi-cultural audience rooted in shared political views rather than a specific ethnic identity. 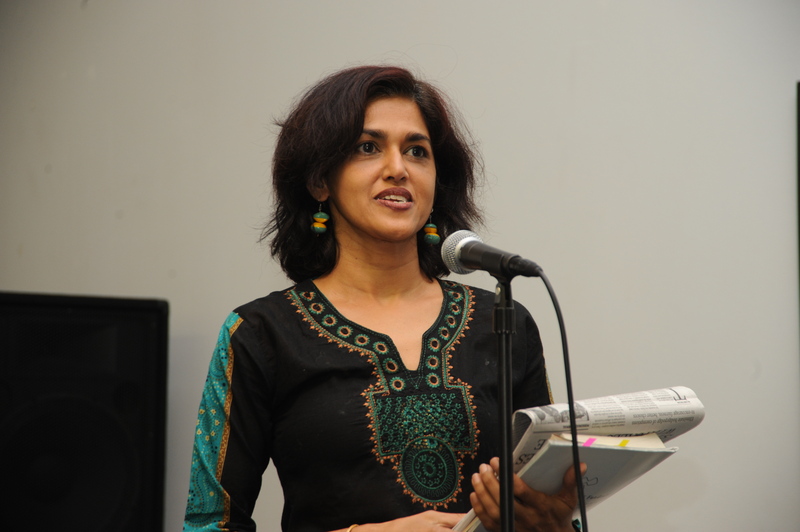 In VBB’s current Borderlines series for example (Fall 2013-Spring 2016), productions address commonalities between Latin American and South Asian cultures, focusing not only on the impact of border conflicts in both regions but on the common struggles, joys, and cultures of individuals and neighborhoods in each place. By giving Houstonians an opportunity to experience these diverse cultures through art, VBB achieves the “mathematically impossible,” forcing parallel lines and lives to converge.